As I stood marveling at this On Kawara painting at the Art Institute of Chicago over the holiday, a young boy and his mother approached the piece. The boy turned quickly to her and said, “it’s only a day,” and I was reminded of an NPR interview with art critic Jerry Saltz that I recently heard. Saltz said in regard to Jackson Pollock’s work, “I just think those paintings put off more energy than went into making them, and that’s one of the definitions of art.” A work that emits more energy than went into making it. I think that’s a wonderful description of what I experienced with the On Kawara painting. 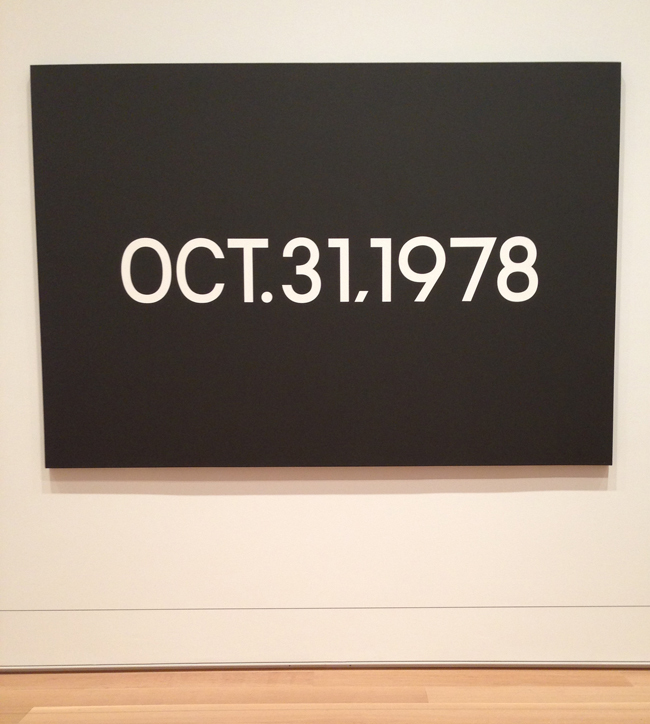 Since January 4, 1966, [Kawara] has made a long series of “Date paintings” (the Today series), which consist entirely of the date on which the painting was executed in simple white lettering set against a solid background. The date is always documented in the language and grammatical conventions of the country in which the painting is executed (i.e., “26. ÁG. 1995,” from Reykjavik, Iceland, or “13 JUIN 2006,” from Monte Carlo); Esperanto is used when the first language of a given country does not use the Roman alphabet). The paintings, executed in liquitex [acrylic paint] on canvas, conform to one of eight standard sizes, ranging from 8×10 inches to 61×89 inches, all horizontal in orientation. The dates on the paintings, hand-painted with calculated precision, are always centered on the canvas and painted white, whereas the background colors vary; the paintings from the early years tend to have bold colors, and the more recent ones tend to be darker in tone. For example, Kawara briefly used red for several months in 1967 and then returned to darker hues until 1977. Four coats of paint are carefully applied for the ground and each allowed enough time to dry before being rubbed down in preparation for subsequent coats. Eschewing stencils in favor of hand-drawn characters, Kawara skillfully renders the script, initially a sans-serif, elongated version of Gill Sans, later a quintessentially modernist Futura. Each work is carefully executed by hand. Some days he makes more than one. If Kawara is unable to complete the painting on the day it was started he immediately destroys it. When a Date Painting is not exhibited, it is placed in a cardboard box custom-made for the painting, which is lined with a clipping from a local newspaper from the city in which the artist made the painting. Although the boxes are part of the work, they are rarely exhibited. Each year between 63 and 241 paintings are made. Each Date Painting is registered in a journal and marked on a One Hundred Years Calendar. When Kawara finishes a painting, he applies a swatch of the paint mixture he used to a small rectangle that is then glued onto a chart in the journal. Under each colour is a number showing the painting’s sequence in that year and a letter indicating its size. The journal therefore records the details of the painting’s size, color and newspaper headline, while the calendar uses colored dots to indicate the days in which a painting was made, and to record the number of days since the artist’s birth. Kawara has now created date paintings in more than 112 cities worldwide in a project that is planned to end only with his death.